1 Light (showery) rain till 0500. Around 0515 a blustery shower with three rumbles of thunder and also accompanied by some small hail (<0,5 mm). Total rain: 6 mm. The gusts reached values of around 50 kt. Afterwards cloudy with a variable amount of Cu, Sc, till noon also remaining rather windy (gusts 35-40 kt). 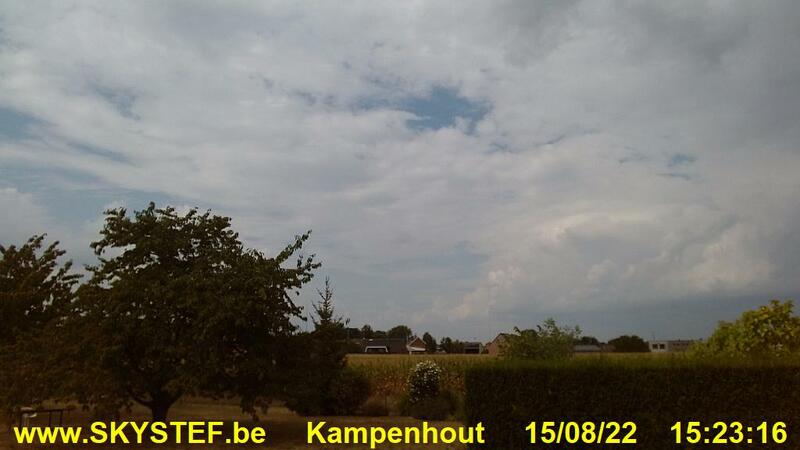 This morning weak to moderate thunderstorms over provinces of Oost-Vlaanderen, Antwerp, Limbourg, Liège & Brabant. Also this morning, the gusts exceeded in every station the mark of 41 kt. Top was Ernage with 60 kt, followed by Ghent, 52 kt, Mont-Rigi, Ostend, Beitem & Zaventem 51 kt, Koksijde 49 kt, Deurne & Spa 47 kt. Legend: TxBE (°C) = Top Tmax Belgium, TxBR (°C) = Tmax Zaventem. aw = Deurne, be = Beauvechain, bl = Kleine Brogel, br = Zaventem, bt = Beitem, ci = Charleroi, cv = Chièvres, dt = Diest, er = Ernage, fn = Koksijde, fs = Florennes, gh = Ghent, lb = Elsenborn, lg = Bièrset, mr = Mont-Rigi, os = Ostend, sh = Saint-Hubert, sp = Spa, sz = Semmerzake, uk = Ukkel.